This food and drink festival includes 40 chefs and 25 craft cocktail participants. The lineup includes tastes from a wide variety of restaurants, like Birch, Redbird, Wax Paper, Ozu East Kitchen. Drinks will come from Elysian Brewing, Nighthawk Breakfast Bar, The Raymond 1886, and many more. All proceeds go to Union Station Homeless Services. Masters of Taste takes place this Sunday, April 3 from 3:00 p.m. – 7:00 p.m. Tickets ($125) are still available, and can be purchased online. Chef Walter el Nagar’s Barbershop pop-up restaurant is embarking on an international tour (first stop, Barcelona), and he’s taking his Exploded Xiao Long Bao with him. Get one last taste this month—the farewell dinners will include highlights from the last three years, plus new dishes he plans to serve abroad. Barbershop is popping up in Venice at 436 Lincoln Ave. (424-272-5849) every Tuesday and Wednesday until April 20. Reservations required—find tickets here. You know it, you love it. Artisanal L.A. has become a food-frenzy mainstay in Los Angeles, and for good reason: lots and lots of yummy stuff from the city’s craftiest indie food makers (and other artisan types). The Spring show will include tastings from Little Spoon Frozen Pudding, Pickled by Hattie, Burkart Organics, Marco Paolo Chocolates, and lots more. You can also expect DIY workshops, cooking classes, and goats! Artisanal L.A. spring show takes place on April 9-10 at The Reef, 1933 South Broadway. Tickets can be purchased online. Last year this event sold out, so if you want to see what all the hubbub is about (we’re thinking it has to do with beer), here’s your chance. The 8th annual installment will feature sampling of domestic and foreign beers, food trucks, music, a dueling piano bar, and probably a lot of buzzed people. Proceeds go to Noah’s B-ark, an organization that rescues dogs from shelters and aims to find permanent homes for them. L.A. Beer Fest takes place April 9 at Los Angeles Center Studios, 450 South Bixel St. Tickets can be purchased online. Food culture is a big part of the annual Los Angeles Times Festival of Books. This year’s lineup includes panels, featuring Alice Waters, Jonathan Gold, and Padma Lakshmi. There will also be cooking demos from chefs/cookbook authors, like Tal Ronnan, Duff Goldman, and Brendan Collins. LA Times Festival of Books takes place April 9-10 at Downtown Arts and Education Corridor adjacent to Exposition Park. Admission is free, but conversations and panels require tickets (which are free, but if you reserve online there’s a $1 processing fee). See more details here. Seoul Sausage is hosting a party to celebrate the release of Koreatown, a book by Deuki Hong and Matt Rodbard. The two spent two years touring Koreatowns across the country, interviewing 100 chefs and business owners to compile a collection of recipes, profiles, and essays. Tickets to the event include dishes from Chris Oh and Deuki Hong, soju, Koreatown-inspired cocktails, and a signed copy of the title. Koreatown: A Cookbook Release Party takes place April 12 at 236 S Los Angeles St #G, from 7:00 p.m. – 10:00 p.m. Tickets are $50 and can be purchased online. 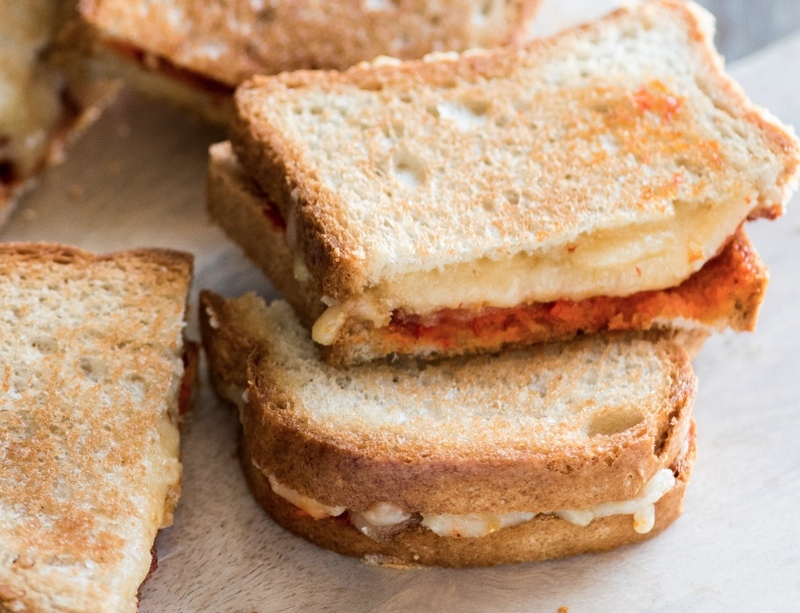 April is National Grilled Cheese Month, and while national food months aren’t really are thing, we’ll make an exception for this celebration. Every Thursday in April, La Brea Bakery Cafe will offer a special menu of three grilled cheese variations, each paired with wine or beer. The Cowboy, a combo of short rib, jack cheese, and BBQ onion jam on a 3-cheese semolina loaf is just one tempting example.